TPS has been supporting Leeds Trinity University since 2011 – developing, reviewing and implementing their Integrated Transport Strategy, as well as monitoring progress towards their objectives and targets on an annual basis. The University has made some impressive improvements to their estate in recent times, including the opening of a new on-campus student residence. 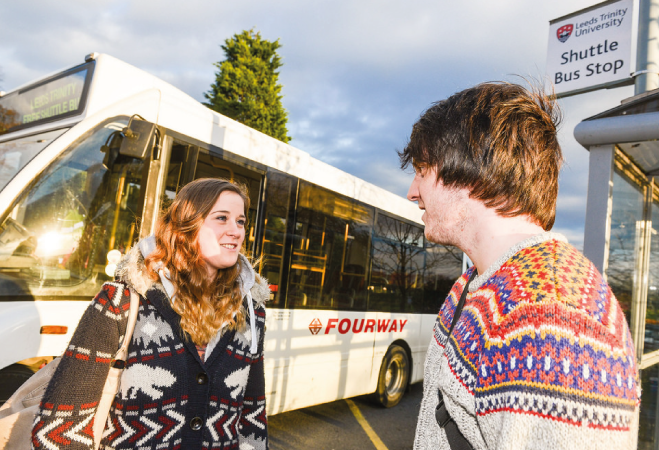 Whilst some of these developments in themselves have helped reduce the need for some to travel to the campus from off-site, the University are keen to improve transport choices on a voluntary basis above and beyond what is required of them through planning. As part of our wider commission, TPS has been engaged to review, update and improve the Universities car park management strategy. The objective of this process was to ensure that the University are maximising the benefit of the limited parking spaces available on campus, by ensuring that they are available for those that need them the most. Running in conjunction with this initiative, our team were also asked to re-tender the shuttle bus services which has been running from Horsforth train station to the campus since 2007. Following the opening of new stations at Kirkstall Forge and Apperley Bridge in 2016, the University were keen to make the most of these new transport links. Following advice from TPS, enhancements were made to the Horsforth shuttle to better coincide the bus service and rail timetables. This has been so popular that an additional vehicle has since been introduced to cater for demand in the morning peak. An additional trial service between Apperley Bridge and the campus has also been running since Sept 2016. TPS are now working with the University to make further enhancements to their network of shuttle services in 2017, and are pleased to continue our support.